Members of the Fulton Fire Department with Ronald McDonald, the Hamburglar, McDonald's employees and B104.7 radio personalities outside of the Fulton McDonald's during Public Safety Appreciation Day. Fulton public met with members of the Fulton Fire Department and Fulton Police Department, Ronald McDonald, and Humburglar. Members of the Fulton Fire Department with Ronald McDonald, the Hamburglar, McDonald’s employees and B104.7 radio personalities outside of the Fulton McDonald’s during Public Safety Appreciation Day. Young children had a chance to get in a Fulton fire engine and speak with local firefighters. Lieutenant Ryan Maxam hands out fire safety information to community members at McDonald’s. Fulton Police Department and Fulton Fire Department interact with the public at McDonald’s public safety appreciation day. FULTON, NY – The Fulton McDonald’s brought together local law enforcement for a public safety appreciation day on Saturday, October 14. 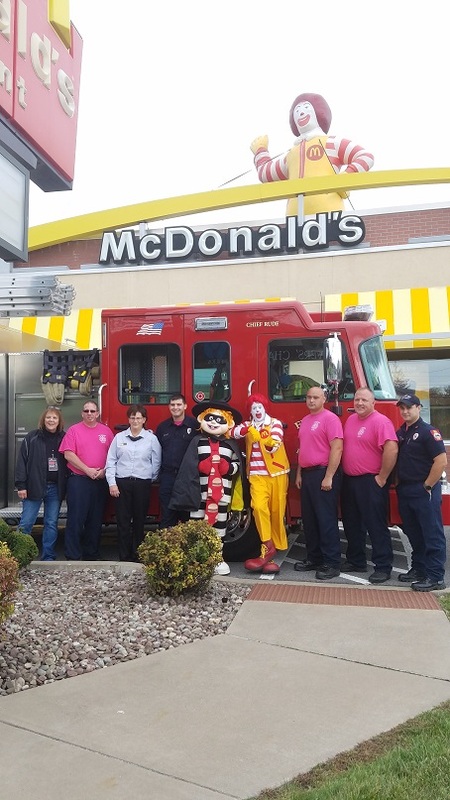 Members of the Fulton Fire Department and Fulton Police Department joined B104.7 radio hosts, Ronald McDonald, and Hamburglar to interact with local families. Kids were able to answer fire safety questions with FFD firefighters to receive a bag full of information and items to encourage fire safety practices at home and take a turn sitting in the driver seat of a fire engine. “Seeing as this month is Fire Prevention Month, it’s an ideal time to be out to interact with the public and give some education on fire safety and prevention. In a bigger picture, it’s a way to help save lives,” said FFD Captain Adam Howard. Members of the Fulton Fire Department will be in schools throughout the community to educate students on fire safety as well. “It’s a good time to remind everyone of the things they can do at home to be safe- check your smoke detectors, change batteries, have a plan and practice fire drills, develop safe cooking habits. And if anyone ever has any questions, they can always stop by the fire department,” Captain Howard said. Fulton police officers answered questions, handed out information and treats for kids, and allowed an inside look at patrol cars. “It’s good for us to put out this positive image especially with all the negative portrayed in the media. It’s good for people, especially kids, to know they don’t have to be afraid to approach us if they need help,” said FPD Patrol Officer Joli Mcgrath. “When we’re typically seen in the community, we’re doing business- issuing a ticket or making an arrest. Especially when kids from troublesome homes see us, we may have to arrest someone they care about. It’s good to get out here and let them see we’re human beings too. We care,” said FPD Deputy Chief Craig Westbrook. Ronald McDonald and Humburglar were on hand to take pictures and chat with children. Anyone who purchased any Extra Value Meal received a free Happy Meal during the event. “Fulton is a small community, McDonald’s wants to be very involved with that. This is a good opportunity for people to get up close and personal with their fire and police departments. It’s not an intimidating setting and it’s good for everyone to be involved and get the chance to interact,” said Julie Bullock, McDonald’s Customer Relations/Marketing Manager. Paul Ross, owner of ten local McDonald’s including the Fulton location, makes community involvement a priority in all of his restaurants with a similar event occurring in Nedrow next week and a Meet the Chiefs morning next week in Fulton, Bullock said. On Tuesday, October 17 from 9-11 a.m. the new FFD Chief, David Eiffe and Assistant Chief Shane Laws will be at the Fulton McDonalds to introduce themselves to community members and discuss the new ideas and plans they have for the Fulton Fire Department. IT’S NICE TO SEE A ” GOOD NEWS” STORY. FOR A CHANGE. ONE THAT EXPOSES THE CHILDREN, MY GREAT-GRANDCHILDREN INCLUDED, TO THE POSITIVE SIDE OF THOSE WHO CHOOSE A LIFE OF DEDICATION TO OTHERS. MANY TIMES, IN HARM’S WAY. THANK YOU! !